This is Shige from Jstay. Yesterday also weather is nice to do some thing outside. 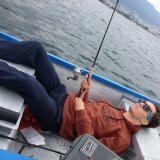 So I went to do fishing Blackbass at Biwako with my friends. From early morning to before evening. It was really tired but good feeling and we could catch many fishes. My friend was sleeping during to do fishing. And I used my new item. It is one of Jstay customer gave me. And I could catch a nice one by it!!! From afternoon Yesterday was shinny. So I got suntan but I do not care of that. Because I had really good times with my friends.